To fully grasp the importance of the bulldozer and the role it plays in the heavy equipment and construction industries, we must start by looking at the history of the machine. From there, we will digress into the features of the bulldozer and its functions within construction sites and other places where it is used to move earth and get tough work done more easily. Prior to the invention of the crawler tractor, for which Benjamin Holt is often given credit, a metal blade was attached to and pulled by livestock to perform dozing operations. Holt’s invention came not long after the turn of the 20th century. An English company, R. Hornsby and Sons, sold its patents for a bulldozing machine to Holt in the 1910s. In the 1920s the use of bulldozers took off as they became more widely available. Since that time, improvements have been made and will continue to be made into the future. Now that we’ve covered some of the history, let’s delve into the features, uses and classifications of contemporary dozers. The bulldozer is an iconic fixture in the class of machines known as heavy equipment. Also known as dozers, track type tractors or crawler tractors, they are synonymous with power and reliability. They are equipped with a hydraulically operated horizontal blade for moving large quantities of earth, rock and other material. The dozer is mounted on tracks and uses its broad blade for land clearing, grading, excavating, placing and transporting materials. Dozers are used in construction projects, mines, agriculture and forestry. Its tracks and low center of gravity provides traction and stability on slopes and unstable surfaces. This also increases the transfer of power to the ground. Because of their metal tracks, these dozers cannot be maneuvered on paved surfaces. There are also a variety of blades and other attachments are available for use with a dozer. These attachments enable the dozer to perform various tasks in different work conditions. A dozer can be classified as a finish grade dozer, production dozer or special application dozer. 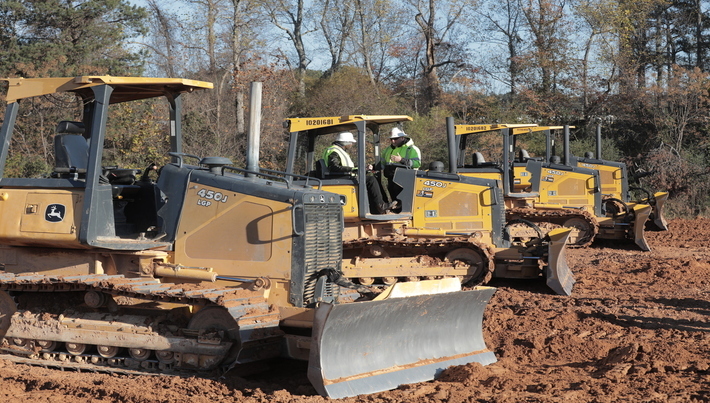 Finish grade dozers are smaller and used for finish grading, light dozing and excavation. A finished grade means that the final elevation and contour of the ground conforms to the desired ground leveling specifications. These dozers are equipped with variable power angle tilt blades (VPAT or PAT blades). The blade can be moved up or down, angled to the left or right, and tilted up or down on either side. The pitch, or vertical angle to the ground, can also be adjusted. 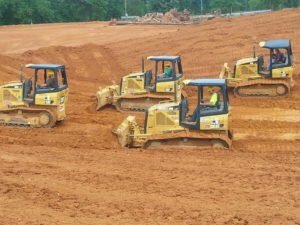 Production dozers are used for rough grading and large-scale production operations where large amounts of material need to be moved or excavated. These dozers have heavy-duty blades to work in tougher environments such as heavy construction, mining and land reclamation. Small – less than 20,000 pounds, 75 – 125 hp. Medium – 20,000 – 60,000 pounds, 125 – 250 hp. Some dozers, such as the Komatsu 575, exceed the weight and horsepower specifications of a large dozer. They are usually used for surface mining and land reclamation projects. The Komatsu 575 A2 weighs 284,337 pounds. It has a 12-cylinder engine producing 1,065 horsepower. 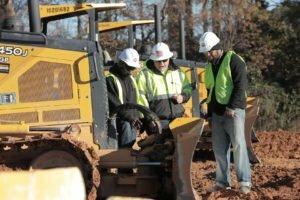 Now that you have a better grasp on the role bulldozers fulfill within the realm of heavy equipment, it’s time to consider a career operating one. Maybe you’ve been dreaming of being at the helm of a bulldozer since you were a little kid. In that case, all you need to make your childhood dream a reality is to enroll in a heavy equipment program at a heavy equipment school. That school is HEC.